Richie has said it before.. We don't go clubbing at night.. AT ALL. 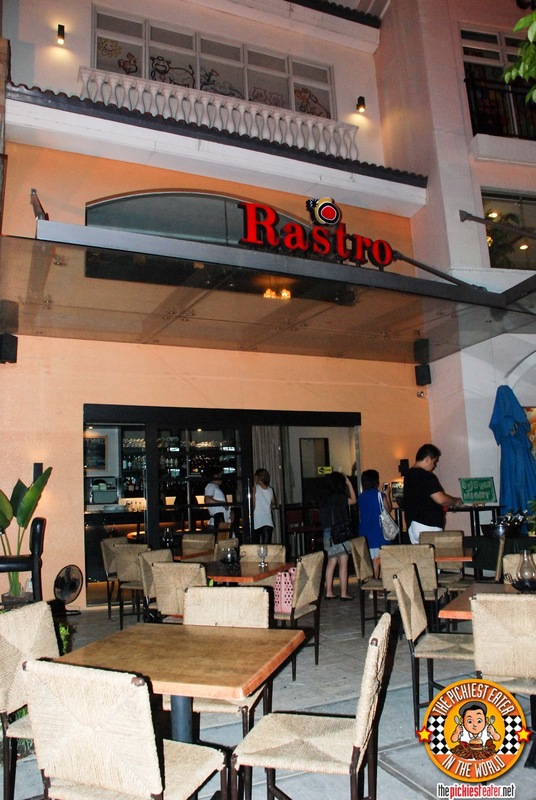 However, Rastro's dining lounge was very comfortable, almost like you were visiting an elegant, yet extremely relaxed, living room. 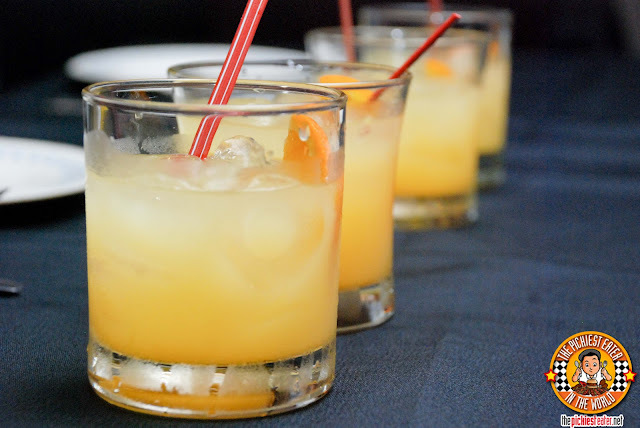 They have a lot of other drinks such as the Harvey Wallbanger, Sidecar, Red Wine Spritzer, and White Wine Spritzer but I only wanted to try those two drinks I mentioned, however I'm sure they're fantastic as well! Enough about drinks *hik!*. Moving on to the food! We were here on a Tuesday. Fortunately, Tuesdays are Osyter Night! Woot Woot! 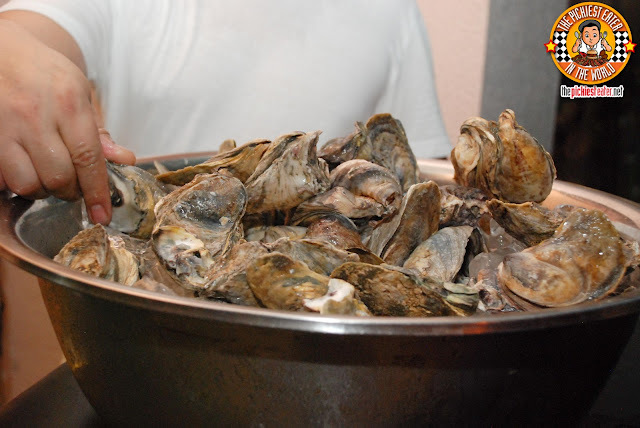 So what better food to accompany our wonderful drinks than some scrumptious fresh oysters! I usually only go for baked oysters, but when the Osyter fritters came, I tried it with the aioli sauce and it was surprisingly good. The aioli sauce helped tone down the fishy taste. I'd still go for the baked though. My personal preference. (I love cheese!) That's why it was no surprise that I loved their Baked Oysters with Pancetta. Oysters, cheese and Pancetta? Winning! Another great starter was the Gambas al Ananda. Everyone was raving about it but for the life of me I'm not sure why I wasn't able to try it. I was probably too busy with my Baked Oysters I'm sure it was superb! 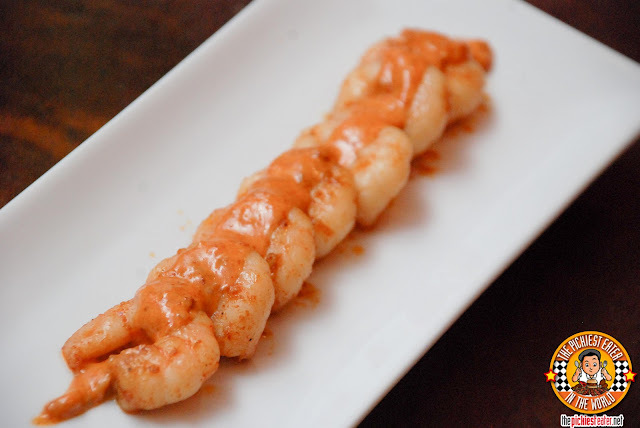 After all, Gambas with crab fat sauce with spices? Who wouldn't love that?! Rastro also has Pizzetas. 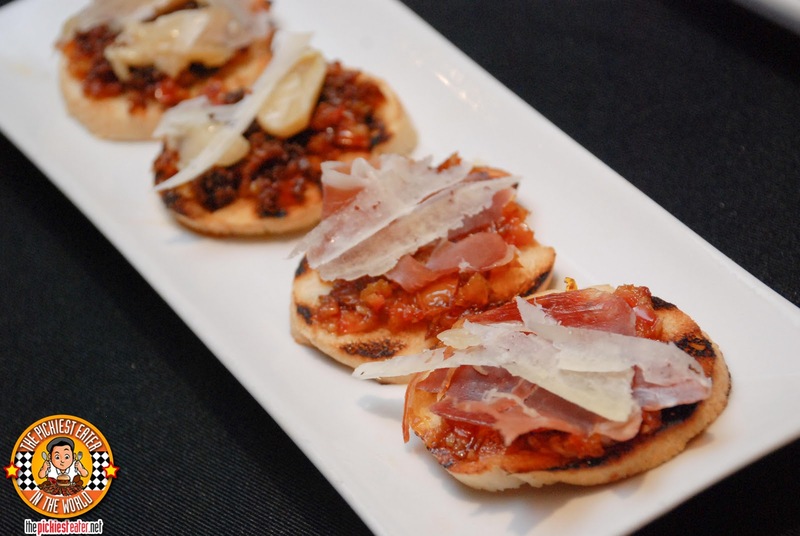 It's a great burst of flavors of chorizo and manchego, and another Pizzeta with Jamon Serrano and Ovieja. I love how it's care-freely made. Just adding one ingredient on top of each other. Every bite is perfect! The Huevos Rancheros was a nice surprise! 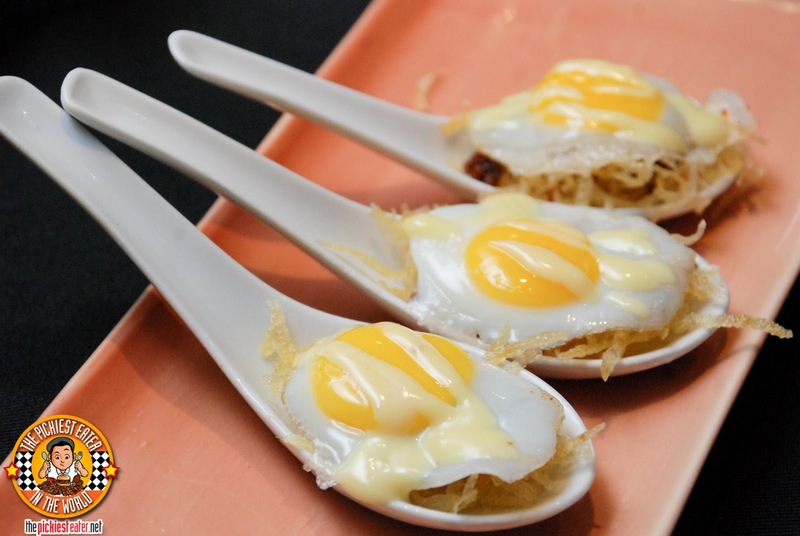 When we tasted it it was served in a spoon. Eat it all in one bite and the results are amazing! 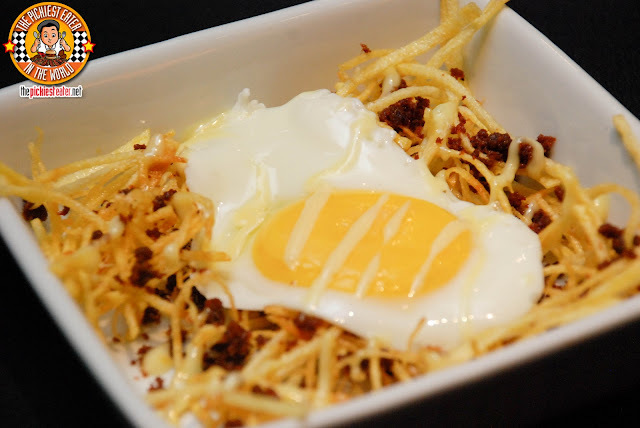 They're shoestring potato with homemade chorizo, aioli and egg. It's like breakfast in a spoon! This is the normal serving of the Huevos Rancheros. Yum!!! These little balls are called the Bolitos Negros. No they're not munchkins. 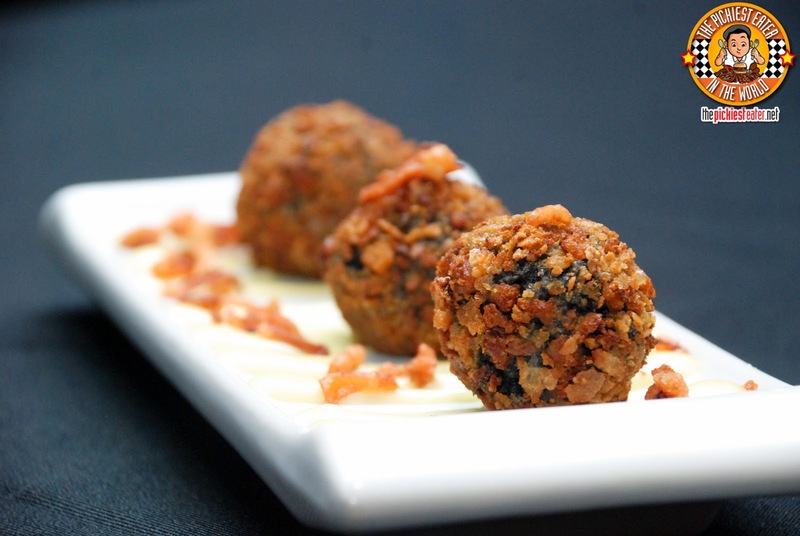 They're actually Fried Paella Negra Balls then drizzled with aioli sauce. Sounds interesting? Well, it is! It was actually good! But easy on this as it can make you full hehe. 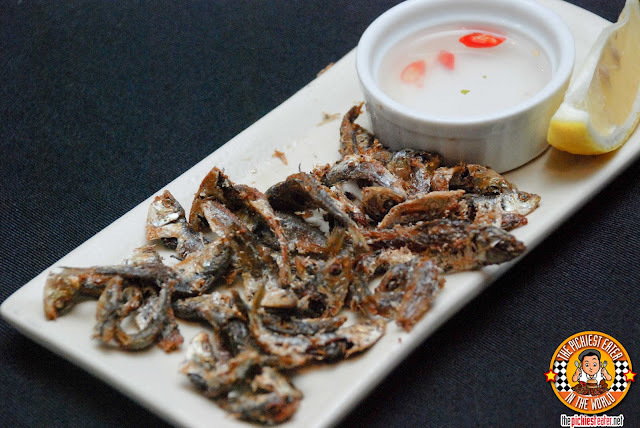 If you want more fishy appetizers, then go for their Tinapa Triangles. 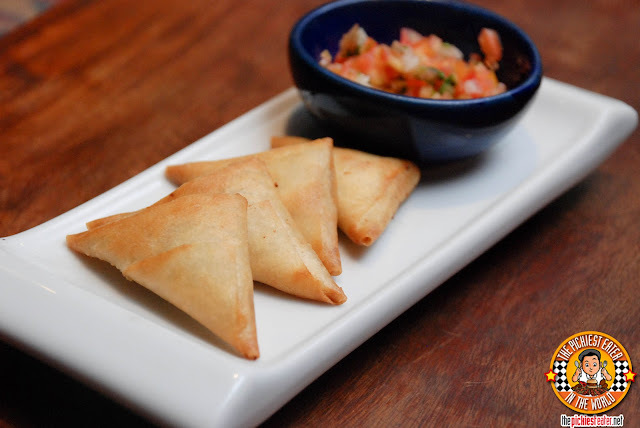 They're mini tinapa and cream cheese triangles with their special homemade salsa. Funily enough, the whole time I was eating this, I didn't know there were tinapa inside! It was so yummy! 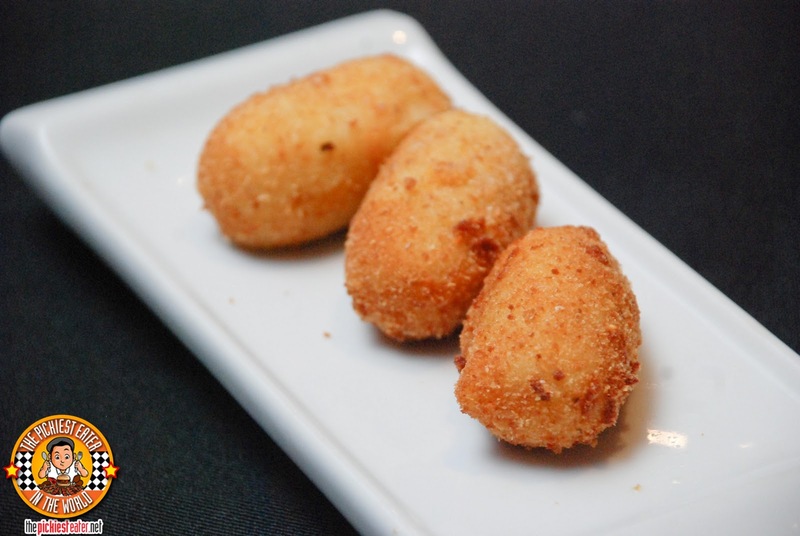 Rastros also serve Croquetas. Croquetas is Richie's favorite. His yaya makes one of the best! And Rastro's version is not bad either! Soft mashed potatoes with bits of tasty chorizo. Also available in Sardinas. And for big groups, let's welcome the Party Platter! 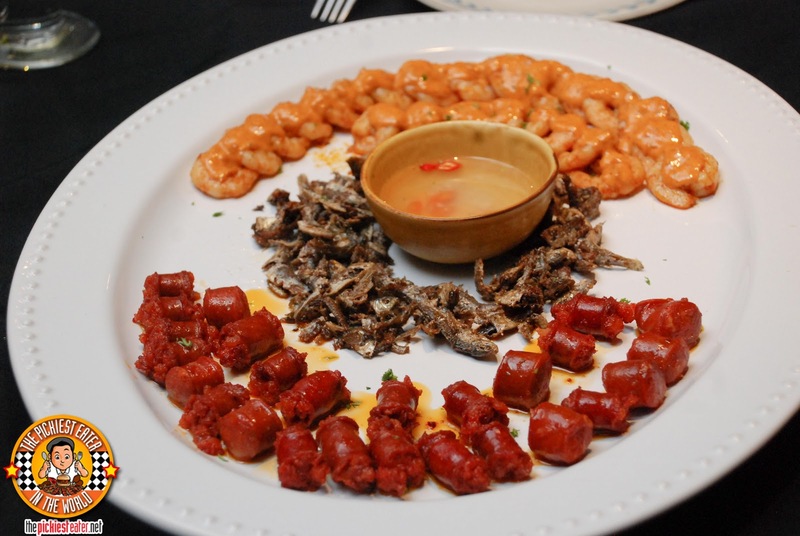 It's a huge plate containing the Gambas al Ananda, Crispy Tawilis, and the Chistora. If you're with your group of friends, this would be perfect to start with. Let me remind you that this isn't even half of the menu yet. These are just starters. We still have a whole main course to go! They also have Paella Negra. I usually prefer not eating something black, which includes Paella Negra, but as you can see in the photo, it's drizzled with some sort of creamy aioli sauce. So I decided to try it. And I was glad I did. 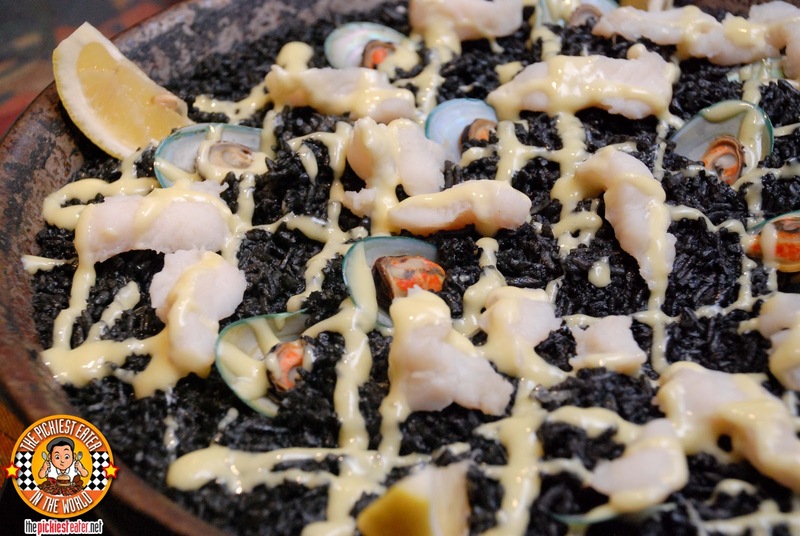 It was the first ever Paella Negra I have tried and I was not disappointed. I would have to say the Pollo Iberico was my favorite main dish of the night. 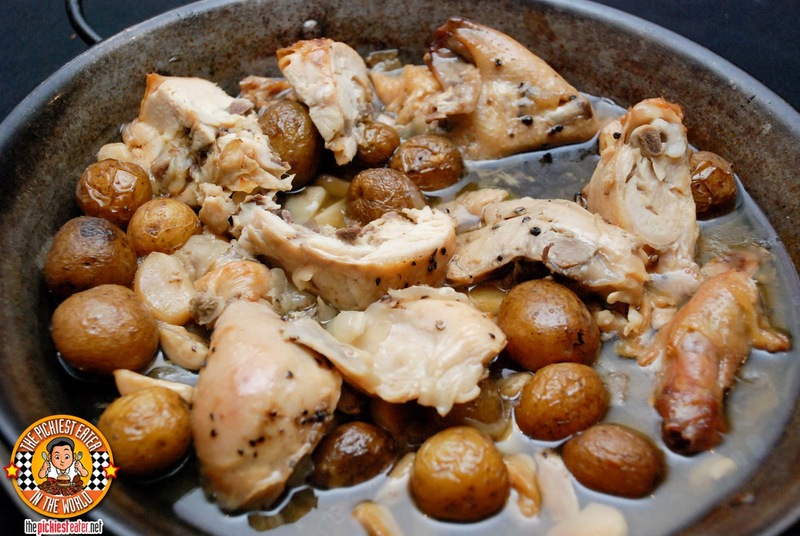 A really tender chicken dish that is marinated in olive oil, whole garlic cloves and herbs. The flavors are so spectacular that Richie and I ended up getting the sauce and putting it on everything! 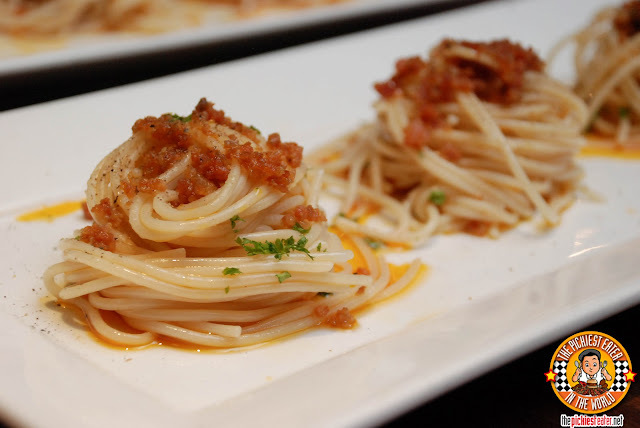 The Chorizo Pasta was a bit under-seasoned for me. 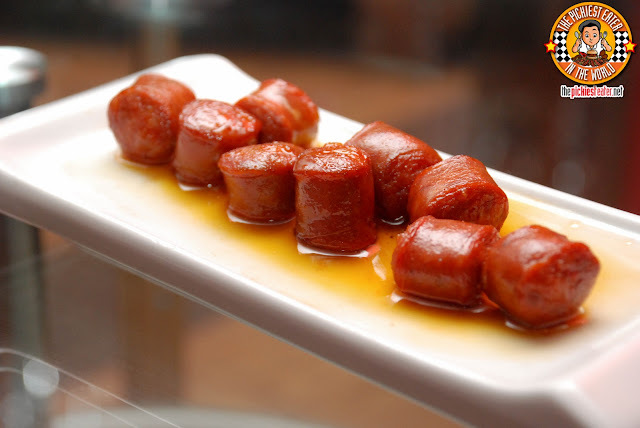 The chorizo was good but it was not enough to add flavor to the whole dish. I personally thought the pasta could have used more salt. What Richie and I did was take the sauce from the Pollo Iberico and mix it with the pasta hehehe. No matter how full I get, THERE'S ALWAYS ROOM FOR DESSERT! 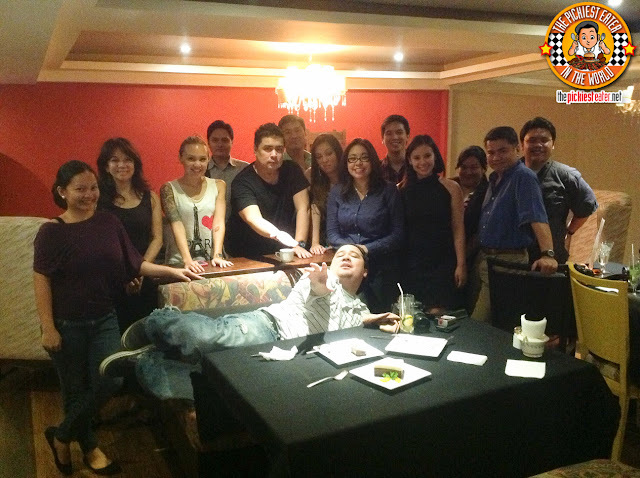 And you must remember this when dining in Rastro, because they have some of the best desserts I have ever tried! First, let me present to you the Turrones Pastor! 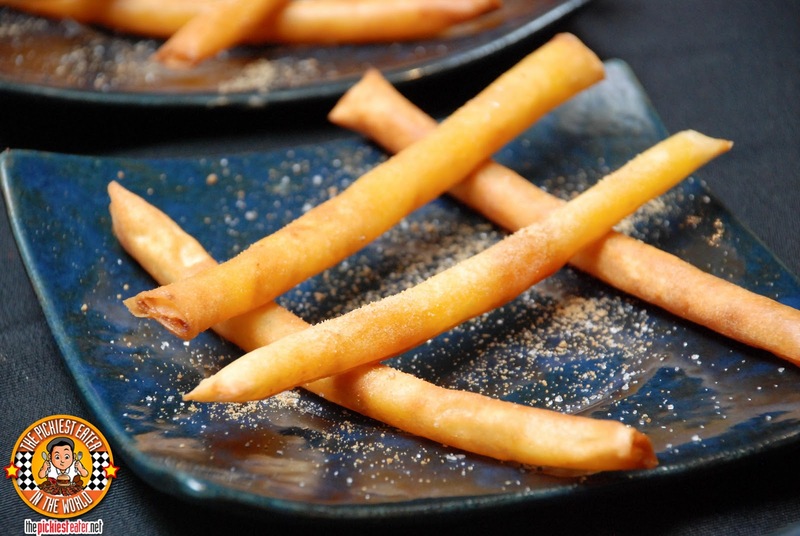 It's a thin turon fried to a golden crisp with creme brulee filling! Oh my Lord! Don't underestimate the size! Size is nothing!!! I think I could snack on 20 of these in one sitting! No matter how good the turrones was, i would say the Triple Chocolate Silk was the star of the night! It's has a sweet oreo crust (You can never go wrong with Oreos! ), two yummy layers of unsweetened chocolate, and then finally for the last layer, a fine layer of white chocolate. 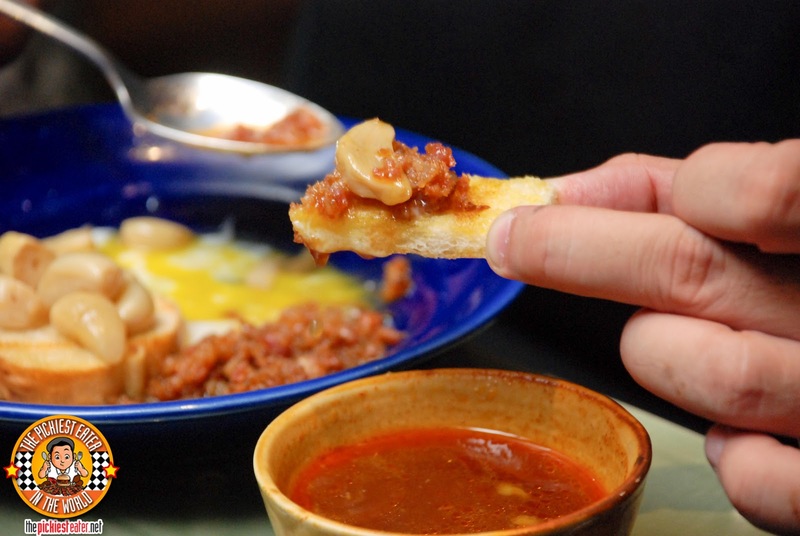 With every bite, you will be taken on a journey though the different awesome, yet distinct flavors of each layer! This was perfect way to end the feast! So will we go back to Rastro? Most DEFINITELY! Anyone of our friends who wants to go out for some drinks, I'm definitely suggesting this place. 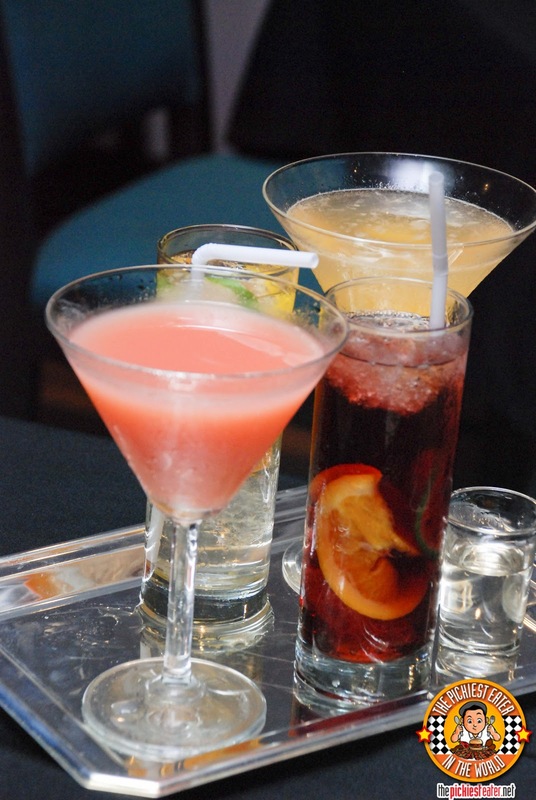 Good drinks, good food, good desserts! Much thanks to our gracious hosts, Ms. Cynthia Nakpil and Rastro PR Consultant Erica Paredes for a wonderful evening! The Triple Chocolate Silk pie was mind blowing! And what are you doing in the couch?!?! 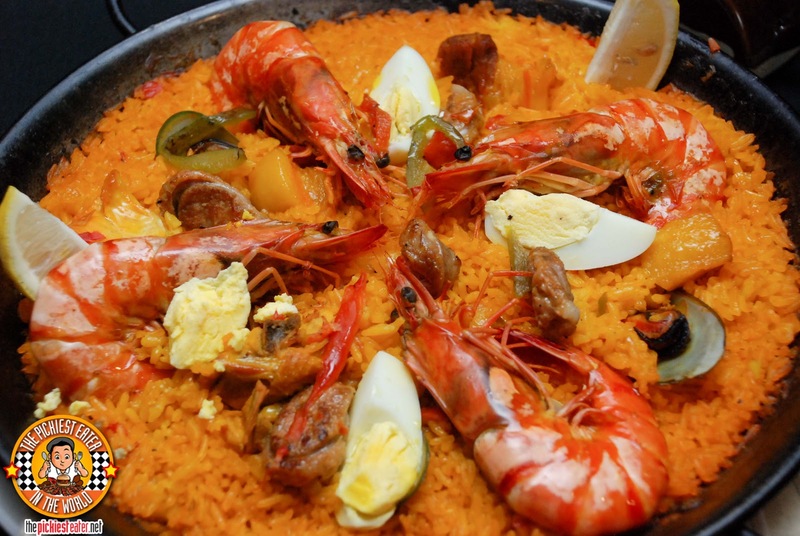 This post just made me so craving for Paella at 10:30 in the morning! Haha re-reading it made me hungry too! 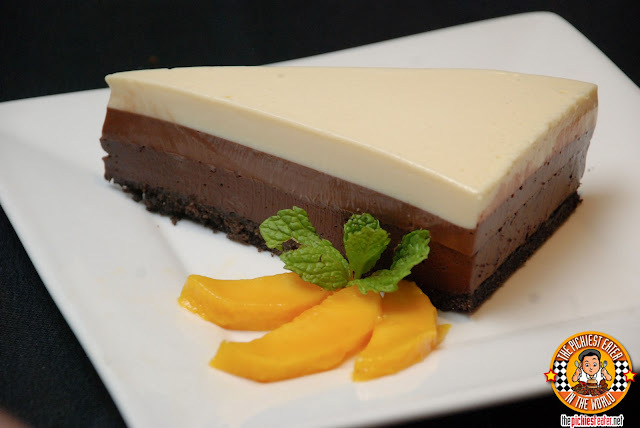 I would like to try this one especially the Triple chocolate silk pie!